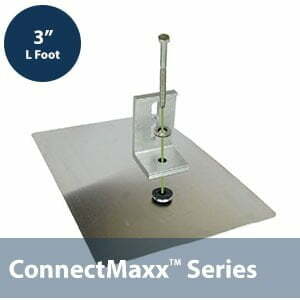 The ConnectMaxx flashing system utilizes a EPDM rubber bushing and when used with Solar compression bracket (milled with countersink), a watertight seal is created, which maintains the integrity of the roof. The ConnectMaxx flashing system requires a single fastener (lag bolt or self-drilling), providing a very fast install. Backed by IAPMO certification, ConnectMaxx delivers a mounting solution for all new or existing (retrofit) composition shingle roofs.